On May 22, 2016 at approximately 2:00 PM, a 1982 Chevrolet Pickup, driven by Randy J. Hensley, was eastbound on Interstate 26, crossing an overpass, between the Meadowview Parkway and West Stone Drive exits. The pickup was towing a car hauler trailer loaded with a 1994 Oldsmobile Custom. Mr. Hensley stated that the trailer began to fishtail, causing him to lose control of his pickup. The trailer became detached from his pickup, and the trailer and the Oldsmobile overturned on the interstate. 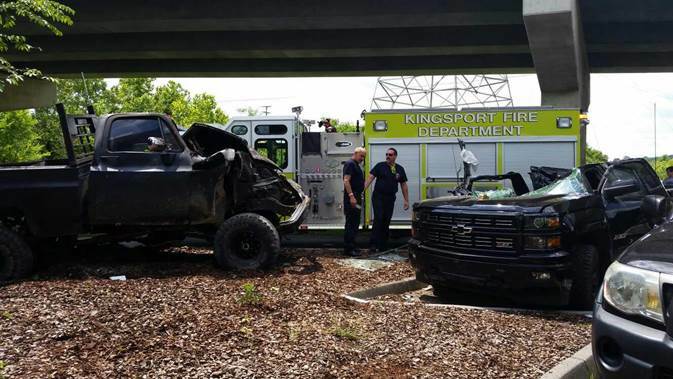 The pickup overrode the concrete barrier wall of the Interstate and plunged into the parking lot of Domtar Park below, located at 1414 Riverport Road. Mr. Hensley’s pickup landed on, and virtually demolished, a 2015 Chevrolet Silverado pickup that was parked in the Domtar Park parking lot. Fortunately, the Silverado was unoccupied at the time. Flying debris from the crash struck and caused minor damage to six additional vehicles parked in the vicinity. Mr. Hensley and his passenger were transported to Holston Valley Medical Center by Sullivan County EMS, but miraculously only for a precautionary evaluation of possible injuries sustained in the crash. Both Mr. Hensley and his passenger were properly restrained by their seatbelts as required by law, which is a dynamic testament that seatbelts indeed reduce injuries and save lives.